Synovial fibroblasts occur as two phenotypes - intimal and subintimal. The specialised intimal phenotype includes expression of uridine diphosphoglucose dehydrogenase (UDPGD), vascular cell adhesion molecule-1 (VCAM-1) and complement decay-accelerating factor (DAF). These gene products contribute to specialised functions relating to tissue movement and leucocyte traffic. 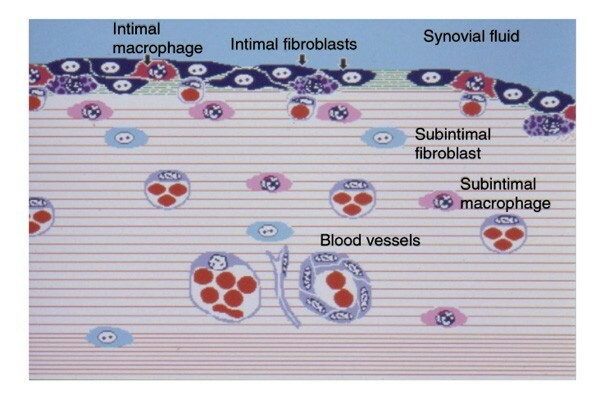 To follow fibroblast nomenclature, synovial fibroblasts should be defined as nonvascular, nonepithelial cells in synovium that arise locally, by division, during embryogenesis, that are replaced by local division, and that synthesise fibrous matrix proteins. Establishing cell origins and functions is not easy, and it is not absolutely certain that such cells even exist. There is no reliable positive fibroblast marker. However, circumstantial evidence suggests that most common leucocyte antigen (CD45)-negative, nonvascular cells in normal synovium fit the definition. In normal human synovium, fibroblasts show two phenotypes: intimal and subintimal  (Fig. 1). Intimal fibroblasts express a specialised range of gene products, including UDPGD, VCAM-1 and complement DAF [1,2,3,4]. The rabbit has two intimal forms, one UDPGD-positive and one VCAM-1-positive. In contrast, both human and rabbit subintimal fibroblasts appear unspecialised. Intimal fibroblasts are known as `fibroblast-like' or `type B' synoviocytes/synovial lining cells . The intimal and subintimal fibroblasts do not remain distinct in tissue culture so the general term `synovial fibroblast' has to be applied (a common source of confusion). Intimal and subintimal fibroblasts may be independent lineages, but the simplest view is of a single lineage that can take on an intimal phenotype in response to local stimuli. Several observations, including that of phenotypic convergence in vitro, support this view. The local stimuli are not known, but the intima does fail to form in immobilised chick embryos . In arthritis, defining fibroblast populations is more difficult . It is similar to watching a football game in which the players have randomly swapped shirts. Numerous different functions and origins have been ascribed to cell subpopulations, but the picture currently remains consistent with a single fibroblast population responding to a mixture of normal intimal environmental signals and the signals of an inflammatory response. Schematic representation of a normal synovium. The intima contains specialised fibroblasts (black, indicated by arrows) expressing VCAM-1, DAF and UDPGD, and specialised macrophages (dark grey, indicated by arrow) expressing Fcγ RIIIa. The deeper subintima contains relatively unspecialised counterparts (labelled). In the foetus, the skeleton starts as a branching rod of cells or blastema , within which foci of chondrocytes develop to determine the sites and shapes of bones. A continuous envelope of cells that express the hyaluronan receptor, CD44, at high level, surrounds these cartilaginous foci . Where this perichondrial envelope lies between cartilage foci, it is known as the interzone. An interzone at the site of a synovial joint detaches itself from the cartilage to become synovium. In sharks, that is the end of the story but, in higher vertebrates, perichondrial cells create another internal surface. Together with blood vessels, they invade the cartilage shaft to create bone marrow spaces, populated by two fibroblast-like cells: UDPGD-positive osteoblastic cells, and VCAM-1-positive cells that support leucocyte maturation (`nurse cells') [9,10]. There are further complexities but, in simple terms, synovial fibroblasts appear to derive from a CD44+ perichondrial stock that also gives rise to bone marrow stromal cells . There is also the interesting implication that the bone marrow evolved in bony fish by putting the functional properties of synovial fibroblast precursors to new advantage. Intimal fibroblast specialisation can be divided into matrix turnover and interaction with leucocytes. Perhaps the defining feature of intimal fibroblasts is their high level of production of hyaluronan , reflected in the high activity of the enzyme UDPGD . Also, molecules associated with basal laminae, including fibronectin, type IV collagen, laminin and chondroitin-6-sulphate-bearing proteoglycans, and two types of microfibril, based on fibrillin-1 and type VI collagen [13,14,15], surround intimal fibroblasts. Other specialised products may include lubricin , phospholipids  and unusual carbohydrate entities . Normal intimal fibroblasts have not been shown to produce matrix-degrading enzymes in situ. However, responses to cytokines in culture and in situ hybridisation studies in diseased tissue suggest that synovial fibroblasts secrete metalloproteinases more readily than most other fibroblasts, and that this may manifest itself chiefly in the intima [19,20]. Synovial fibroblasts may interact with leucocytes and inflammatory pathways in several ways. Intimal fibroblasts express higher levels of VCAM-1 and DAF than any cells except bone marrow stromal cells and lymphoid follicular dendritic cells [3,4,21]. Synovial fibroblasts can also be induced to express complement receptor 2, normally only present on follicular dendritic cells and Blymphocytes . VCAM-1 binds to α4β1 integrin, carried on mononuclear but not polymorphonuclear leucocytes. This probably explains why, in synovitis, granulocytes pass into the synovial fluid but mononuclear cells tend to be retained in the tissue. The result is different for different mononuclear cell subgroups. Macrophages are arrested at the intima; however, they then lose α4β1 integrin, which probably explains why most intimal fibroblasts and macrophages are not in contact, but separated by matrix channels that may facilitate fluid flux. Thus, VCAM-1 does not appear to be involved in continuing intercellular cohesion. It does not mediate adhesion to matrix or other stromal cells, so it is unlikely to be relevant to pathological adhesive processes. T lymphocytes are rarely seen in the intima, even in disease. Taken with what is known about lymphoid tissue architecture, this suggests that, although T cells make functional interactions with VCAM-1-positive resident cells, most then move away. In inflamed synovium, Blymphocytes may be found in the intima but they are almost invariably undergoing lysis . Viable Blymphocytes are only found in subintimal clusters associated with VCAM-1-positive cells. This suggests that the intima is hostile to B-lymphocyte survival, possibly because of the anti-adhesive effect of hyaluronan. The synovial intima shares DAF expression with coelomic linings such as the pericardium and pleura . DAF expression at these sites is associated with local macrophage expression of the immunoglobulin receptor Fcγ RIIIa , and both molecules are adsorbed onto pericellular fibrillin-1-based microfibrils. It seems probable that DAF and Fcγ RIIIa together modulate the tissue response to immune complexes, possibly providing an `early warning' response for internal cavities that might be colonised by micro-organisms. DAF is also a coligand for the macrophage surface protein CD97 . All macrophages in the synovium express CD97 equally, but only the intimal macrophages in contact with DAF-coated microfibrils express Fcγ RIIIa, raising the possibility that DAF and CD97 are involved in induction of Fcγ RIIIa expression. DAF protects leucocytes from physiological killing mechanisms and may be important for survival at various stages of development [24,25]. Specifically, stromal cells express DAF at all sites where cells of the B-lymphocyte lineage reside. Note that, both in ontogeny and phylogeny, leucocyte precursors initially arise in the splanchnopleural coelomic lining . This raises the possibility that aspects of gene regulation `borrowed' from synovial precursors in the evolution of bone marrow stroma had, in turn, been `borrowed' from the coelomic lining in the evolution of synovium. While this begins to make sense of the relationships between these tissues, `borrowing', in Darwinian terms, simply means the chance generation of an advantageous overlap in lineage-specific transcriptional regulation. It is more likely to occur in closely related lineages, but not out of necessity. In arthritic synovium, the intimal phenotype changes relatively little. UDPGD activity is reduced in rheumatoid tissue , VCAM-1 and DAF remain prominent [21,27], while metalloproteinase production is increased but may be very patchy . The major change is in subintimal fibroblasts, which take on intimal features. Here, there is a modest increase in UDPGD activity , VCAM-1 and DAF expression appears locally, and matches intimal levels where Blymphocytes are present [21,27]. Moreover, if a follicular structure is formed, these same cells express complement receptor 2  which, although inducible on synovial fibroblasts in vitro by cytokines, is never seen in the intima, for unknown reasons. The key signal driving these changes appears to be tumour necrosis factor α, although other macrophage and T-cell cytokines are probably also involved. Pannus contains a heterogeneous mixture of cells with intimal and subintimal features. There are also cells with features of chondrocytes, suggesting a mixed synovial and cartilaginous origin . Pannus is probably a nonspecific reaction to cartilage damage, since it appears both in chemical arthritis in animals and in cartilage transplanted into normal subcutaneous tissue . Further similarities between synovial and bone marrow fibroblasts have been observed in synovitis. Shared gene products include bone marrow stromal factor 1, stromal cell-derived factor 1, and bone morphogenetic protein 2 [10,31,32]. These might be interpreted as indicating influx of bone marrow cells; in rodents, contiguity between synovium and bone marrow probably does allow mixing of populations. However, the simpler view is that synovial and bone marrow stromal cells are derived from the same stock and have the same potential for specialised gene expression. The manifestation of that potential depends on the local environment, with matrix synthetic and leucocyte interactive factors being co-expressed at some sites (normal human intima) but not at others (bone marrow, rabbit intima). The further overlap of transcriptional control with lymphoid stromal cells probably makes it relatively easy for synovial stroma to transform into a heterogeneous mixture of bone marrow and lymphoid environments, conferring susceptibility to certain types of immune dysregulation. Synovium is a highly specialised immunologic microenvironment with affinities with splanchnopleura and bone marrow that may explain its involvement in inflammatory rheumatic disease.